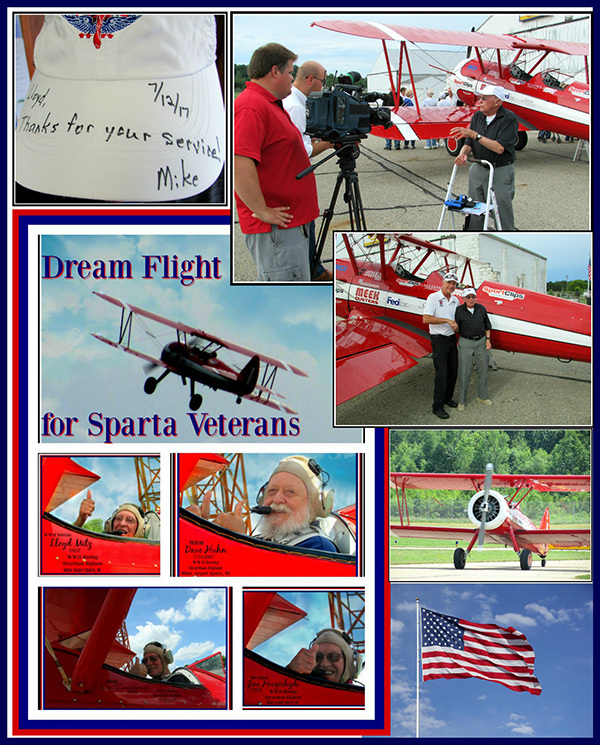 Four Veterans who are members of the Sparta Senior Neighbors center were offered a Dream Flight. These four courageous men, ranging in age from 74 to 95 years old, took flight on July 11, in a WWII Boeing Stearman Biplane. These planes were used in the 1940s to train pilots during WWII. Back then they were not painted in the pretty bright colors they are today. It was a gorgeous day. The sky was blue. The veterans agreed that it couldn’t have been a more perfect day to fly in an open cockpit plane. Lloyd Mitz, age 95 years old, was a Corporal T5 in the 13th Armored. Lloyd was Recon in the WWII Battle of the Bulge. He traveled all over Germany in three different armies during the time he served. He saved an officer’s life by taking him to a German doctor after being hit with shrapnel. Jim Hoogerhyde, age 92 years old, was a S1C (AMM) in the Navy during WWII. Jim oversaw the 80 Boeing Stearman Biplanes and directed the pilots in and out of the base. Jim, just a young 18-year-old, was responsible for working in and around dangerous equipment. He remembers a near death experience working on a plane. Dave Huhn, age 76 years old, was a staff sergeant who flew in the RC130’s in the Air Force during the 1960s. Dave was a Russian linguist and flew 1,000 hours off the coast of Warsaw Pact countries. Don Zimmerman, age 74 years old, was a SP4 in the Army. Don was a low-pressure boiler operator in the 1960s. He came from a military family with two brothers serving, one in the Air Force and another in the Marines. Pilot Mike Sommars and his wife Lynn greeted each veteran. Mike is currently an American Airlines pilot. Mike and Lynn give their time to the Ageless Aviation organization, which provides Dream Flights to veterans around the U.S.
Darryl Fisher, who is a pilot out of Washington, founded Ageless Aviation. Darryl had a dream to make a difference in senior citizen’s lives, as they profoundly influenced him during his formative years. Jane Ringler, coordinator for the Sparta Senior Neighbors, contacted the Miller Sparta Airport requesting flights for the seniors. Airport manager Vic Johnston was helpful in connecting this local senior center with Ageless Aviation.